» Could Terminal be changed so that when maximized, it fills the screen? Could Terminal be changed so that when maximized, it fills the screen? Currently, when Terminal is maximized, it usually does not fill the entire screen, but leaves a small bit at the bottom, apparently because there is not enough room for another line of text there. This looks *very ugly*! I think it would be far far better to take all of the screen and just leave that part of the terminal without any text written onto it. The way it is now, the other applications below it shine through and it is ugly and distracting. Re: Could Terminal be changed so that when maximized, it fills the screen? Have you tried playing around with the settings in its preference window's Appearances tab? I see options for changing font (and font size) and default geometry. Even the one for displaying borders around windows might make a difference. And if it is only the appearance that bothers you and not the lack of an additional (partial) line, you could try setting the application to display the menu bar to see if that makes a positive difference. I agree with MDM: I took a full screen terminal capture but it looks pretty "normal" to me, can you share some representative examples? Have you tried playing around with the settings in its preference window's Appearances tab? Sure, but that is not the right way to do it. What I want is a standard window, maximized, with standard window decorations, menubar, and the font of my choice. To change some of the latter in order to get a fully maximized window does not really make sense. In fact, what one can do is select a new font to be really really small, for example, then maximize, and then select the font to be the one you want. The window will stay fully maximized, but as soon as you unmaximize and remaximize you will be back at a window that is not fully maximized. I don't see the agreement. He is talking about manipulating other settings in order to kludge a fully maximized window, but you are talking about a full screen window, which is not the same thing. A maximized window keeps one's taskbars and such still fully visible, whereas a full screen window does not. They are different beasts. ...play with the 15 value to see if you can get it to fit. Otherwise, it is the font size that dictates the size of the window. You could create a bug report, but I think one was created before and dismissed for this reason. I'll see if I can find it. Edit: This will only work with the GTK3 version of xfce4-terminal. Does it help if you add padding to the terminal window (between the edge of the window and the text)? This should re-adjust the window size to accomodate. This will only work for a specific choice of font and window size and taskbar size. Using this I can find a value to get the window to fill the whole screen vertically for the specific choices, but it also puts ugly unwanted padding on all sides One can get rid of this by using padding-bottom. However, I cannot seem to get the window maximized in the horizontal direction using either padding or padding-right. I like my method more because it always works, does not require restarting the terminal process each time, and maximizes in both horizontal and vertical directions. However, all of these methods are kludges and don't really work. I can't seem to find the bug report. Perhaps you can create a new one and see what the developer says. I don't appear to have your issue - when I maximize the terminal, it fills the entire display. But I hadn't changed any of those settings to non-default values, and thought that you might have done so without realizing that one or more of them caused said issue (if, in fact, that was the cause, of course). Sure, but that is not the right way to do it. I suppose you'd have to ask the developer about that. My opinion on the matter - and yours, come to think of it - is only that, whereas he wrote the application; it may actually be behaving exactly the way he intends it to. And by that, I'm not trying to be... unpleasant. He might have added the option to change to a different font at some point, due to user request, and then decided that this allowed for the possibility of displaying only a partial line of text at the bottom of the window. And, so noticing, perhaps he then felt that this looked "shoddy." 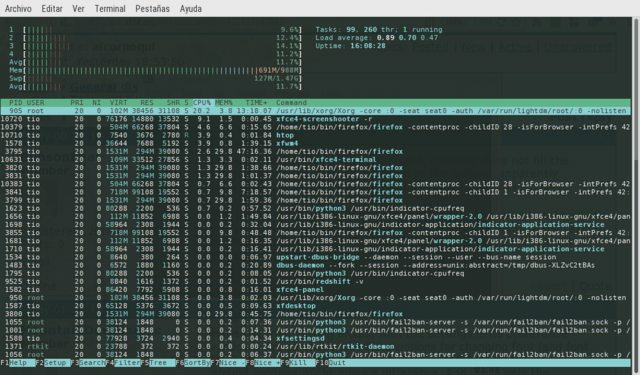 After all, the terminal window - by itself - is not like a web browser window (which is highly likely to have mixed text and graphics, or even all graphics); the terminal window, as it stands, seems to be a text-based environment. But that is merely speculation on my part. However, after seeing what ToZ wrote about a previous bug report, this - to me - seems to fit with my speculation. What I want is a standard window, maximized, with standard window decorations, menubar, and the font of my choice. When I maximize a window, I do not see my taskbars (or panels, whatever folks want to call them). My maximized windows are exactly that, lol. But be that as it may... I do question your use of the term "kludge" here. I suspect that the developer would, too. Unless, that is, you are including "changing to a non-default font" as the first part of your kludge. Semantics? Maybe. But if you cannot fully maximize your window - or at least "partially maximize" it, if you wish to deduct space from that maximization in order to simultaneously display your desktop's taskbars/panels - and cannot do so by doing nothing other than manipulating one or more of the various settings in the terminal's preferences, then by all means, file a bug report. At the very least, you will know that the developer is aware of the issue. And I would imagine you would have a chance to at least see his comment at some point. Possibly even provoke a change that pleases you, IDK. BtW, after seeing the mention of "full screen" (vs. "maximized"), I tried the terminal's fullscreen mode, too. I was still unable to see your issue. And I just realized that I might be using an old version of the application. I have 0.6.3 on this particular partition. Are you running a newer version? If so, did your issue appear only with that version, or (if you remember) was it also present with the one that I am using? I'm just trying to verify that it's due to your different settings (font size? I assume you're at least still using a monospace font of some size, but perhaps not? ), as opposed to an actual bug that was inadvertently introduced with a new version. ToZ: The person who filed this bug was using kwin as his WM - but might this have been the bug report that you were thinking of? It is certainly an old bug report (opened in 2010, lol, and last modified in 2012) but the developer does not appear to have addressed it (or commented). That's all I found after looking through the 66 bug reports at the official Xfce (and related) bug reporting website (bugzilla.xfce.org). Whilst doing my searching, I discovered that at least some distros have their own bug pages for Xfce's terminal. I saw the one that Debian has, but chose not to dig through it, because its existence led me to believe that there could be a number of other such websites - and I have to leave in just a few minutes. And it looks like Ubuntu has a list of (this application's) bug reports on Launchpad. So finding the one you remembered could be the proverbial hunt for a needle in a haystack. I probably won't bother since strictly speaking it is not a "bug". I think it is awful design, but you know, when you maximize a window in macOS, for example, it does not take all available space either. They have explicitly intended to do this, it seems. Too bad. I will probably switch back to Konsole. I was hoping to get rid of all KDE, but alas Konsole and Ksysguard do not seem to have adequate replacements. This is also dependent on the font and font size. Okay, well, I grabbed the source and changed it after all. It was just a matter of removing the hints that were being set and which prevented the window manager from doing the default action for a maximization. So now the terminal windows act just like all other windows. Wow, that's impressive! Can you share the changes you made? It's not impressive, it's a totally trivial change, and not complete, but good enough for me. The result is that the window can be set to any size one wants, which might not be ideal. One might prefer to have the window fit the number of rows exactly unless it is maximized or full screen. I don't care on this one way or the other so I did not bother to figure out how to retain that feature while getting the maximizing the way I want it. For general use of course one should also add a preference to turn this on or off but personally I do not need that. Hehe, I'm easily impressed... Thanks for the info!